Writing an obituary can be very overwhelming for a family that is overcome with grief. It is not the most pleasant article to write, but if done correctly, it is a positive piece that creates a life celebration for your loved one. It also properly informs the community of his/her passing. Below are 10 easy steps to assist you in creating an obituary. Get a copy of your local paper. Some newspapers may require obituaries to be written in a specific style. Ask the obituary department at your local newspaper if there is a certain format that must be followed. You can also acquire many ideas by reading other obituaries in the paper. Decide on a price limit to suit your budget. Often newspapers charge by the column inch, and extensive tributes can cost hundreds of dollars. 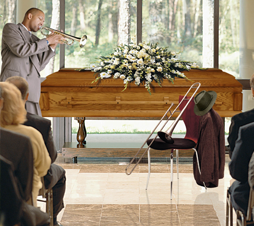 Sometimes funeral homes include a basic obituary as part of the funeral package. Find out what the deadline is to submit your obituary. Full name of the decedent. City and state where the decedent was residing. Names of the next kin. Time, date and location where the services will be held. Most obituaries follow a noun/verb format. Focus on getting the format correct not on the style the newspaper requires. Editors can help format your obituary once you have completed it. Make sure you have someone else proof-read the obituary. Be sure the spelling and grammar are correct but most important make sure that all family members were included. When you are writing and reading the obituary, think about how your loved one would want others to remember him/her. If there was an important hobby it's often nice and appropriate to include that information. If he/she was close to extended family or a special friend you should make an effort to include those people in your writing. Submit an electronic copy via e-mail or CD. 90% of obituary errors start with people (or funeral homes) who submitted a typed or handwritten copy. Even if you type it on your computer and fax it in, the editor at the newspaper will have to scan it in or re-type it. Errors can occur. You can also personally submit it to your newspaper. Request to receive a copy from the newspaper before your obituary is printed if you're worried about mistakes. Submit the obituary to other newspapers. If there are other cities where you would like the obituary to be read make sure to contact the obituary department and inquire about pricing and deadlines. Make sure it reads correctly in the newspaper. If there are errors, notify them immediately. Usually they will re-print it for the next day at no charge. Legacy Cremation Services hopes that these tips and guidelines have helped you learn how to write an obituary that will honor your loved one. We understand that you have suffered a great loss and our professionals are pleased to assist you in any way.